In these times of increasing crime and theft, it has become imperative to safeguard your house with adequate safety devices. Installing a home burglar alarm system can go a long way in providing you with protection against thieves and intruders. Burglar alarm systems commonly used today are electronic systems of sensors that detect intrusion and trigger off an alarm. Find out how burglar alarm systems work and what are the factors to be kept in mind when installing one for your house. Home security industry is constantly evolving to come up with new and innovative techniques to keep the burglars at bay. Burglar alarms range from the simple alarms, do-it-yourself burglar alarm kits to the sophisticated whole house electronic gadgetry. What are the basics on which most home burglar alarms are built? The cost of any burglar alarm system depends on the equipment and technology being used but also the layout of the house, the distance of the home to the alarm company and the amount of wiring that is required. It is essential that you understand your burglar alarm system and its features well so that you make best use of it. Ensure that all family members are clear with the instructions for its operations. Opt for a reputed home security company with a proven history or service and reliability. Sensors: To detect the presence or movement of an intruder usually a PIR device used as a motion detector. It can be also a Piezo electric sensor to detect breaking of glass panes or a magnet activated switch for the doors. Control Units: All sensors and door/windows switches are connected to this central control unit which allows you to easily program the alarm system. The control unit, when triggered will raise the built in alarm as well as an external loud hooter. It can also call an external security agency or the police. Many control units use reserved Radio Frequencies to communicate with sensors thus simplifying the process of installation. Some of these control units also come with car-style remote keys to not only arm/disarm the alarm, but also to trigger the alarm when threatened - Panic Alarm. Alarm: These devices sound the alarm - a rhythmic sound - cacophony in the immediate neighborhood. External devices with built in battery backup can sound the alarm continuously for a few minutes when they are triggered. Perimeter Defense: This is the immediate outside region of your home. A low tech device like a high wall can still act as the first line of defense. A Passive Infra-red (PIR) sensor which triggers flood lights on the drive way can ward off the budding prowlers. So can a low tech huge dog. A simple CMOS video camera, the size of a lighter can come in handy to send images of prowlers to your television or to your digital video recorder which runs on a closed loop. These days DVRs are available with 1 TB hard drives or more to store compressed video images in 4/8/16 channels. They even come with built in network card and communication software to make them viewable from anywhere in the world through the Internet. You can control/monitor these Digital Video Recorders through a password protected web interface. Some DVRs also back up to sound the alarm in the event of a motion detected through the monitored camera. Buy a camera with Pan and Tilt assembly which can save you the trouble of adjusting the angle of the camera every time you want to take a better look. These cameras are sensitive to infra red light waves and as a result, do not require visible lights on. They can work with IR LEDS which are sufficient to produce a reasonable quality image. Combined with a PIR motion sensor, the CCTV cameras provide the best perimeter defense. All doors and windows can be fitted with switches or sensors which alert a central control system living inside the house. Inside Home Defense: This is the second line where you try to guard the master bedroom or the family living quarters. Hallways are ideal for installing PIR motion sensors. They are less likely to trigger a false alarm as the interiors of the house shield the sensors from sudden change in temperature or pet animals. PIR motion sensors have to be positioned in an angle to be effective. They trigger best when the intruding body moves in a perpendicular direction from the sensor. It is a good idea to install the smoke detectors at the roof to warn you off any potential fire hazard. Burglar alarm systems for the home can offer perimeter protection or interior protection. The interior alarm system must be able to trap any possible intruder in case he has been overlooked by the perimeter security system. Decide on the level of security preferred and the budget as well as the plan or your house. Panic buttons which enable you to summon for help in case of physical attack is useful if it is done discreetly. Position them strategically around the house. Most home burglar alarm systems involve a circuit loop system that rings a bell or activates a siren when set off. A central control box monitors several motion detectors and perimeter guards and sounds an alarm when any of them are triggered. Some Burglar alarms work on the concept of magnetic contacts. Sometimes special screens are set up at particular windows to detect presence of a burglar. Sensors are placed in the hallways or large rooms, which activate an alarm when the beam of light is interrupted by a person walking across it. Motion Detection is also carried out by ultrasonic means. These methods work best when you are away from your house. Point detector burglar alarms bring to notice any intrusion at a specific point, such as door or windows. Area detection for intruders is done within protected areas with the help of ultrasonic transducers and passive infrared detectors. These sensors can be used individually or in combination depending on the kind of burglar alarm sophistication you desire. Closed circuit televisions are commonly used to detect the presence of unauthorized persons. Smoke detectors can also be added to some burglar alarm system. Sophistication ranges from small, self-contained noisemakers, to complicated, multi zone digital systems with color-coded computer monitor outputs. Closed circuits are normally a better choice than open circuits because an intruder can deactivate the open circuit by simply cutting the connected wires. Alarms can range from siren or loud alarms to telephone auto dialers and flashing outdoor lights. 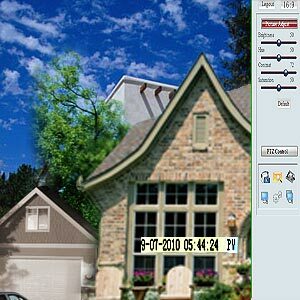 This serves the function of alerting the neighbors of possible intruders and also works as a signal to the police. Auto dialers attached to home burglar systems are programmed to dial the police and play a prerecorded message that informs the police of the address of the house being burgled. Some burglar alarms are activated to inform the home security organization or alarm-receiving center, where necessary steps are taken. A home burglar alarm must have audible system that allows the alarm to be heard in any part of your home as well as the neighbors. Ensure that the home burglar alarm you choose meets the electrical safety standards. Home burglar alarms must be able to function on house electrical supply or battery back up. Temporary electrical blackouts must not trigger off an alarm. You can install a fire alarm along with your home burglar alarm system. If you cannot spend on a sophisticated burglar alarm, you can try your hand with a DIY burglar alarm kit. Ever so often, a simple burglar alarm can be sufficient deterrent. The fallout of home burglar alarms is the possibility of false alarms. Burglar alarm systems must be routinely checked to see that the sensors are working and that the correct signals are getting through to the monitor. Some systems are designed to identify problems such as dead phone lines, loose connections or drained batteries.